Ant-Man was a fun if not frilly superhero movie and one I did quite enjoy even if was forgettable. 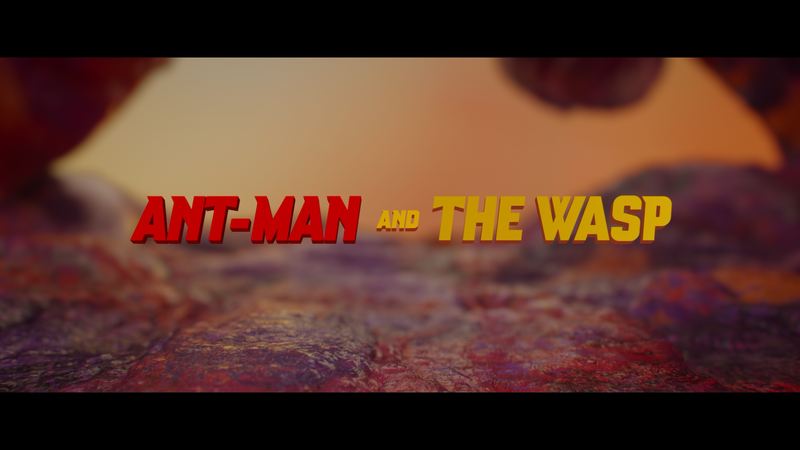 Now comes Ant-Man and the Wasp and… kind of like the first, I found it entertaining but ultimately nothing really stood out, save maybe for the mid-credit scene which ties directly into Avengers: Infinity War and its sequel. Scott Lang (PAUL RUDD) is under house arrest following the events of Captain America: Civil War, but as part of his deal, he obviously cannot don the Ant-Man suit and he literally is relegated to his home wearing an ankle monitor. 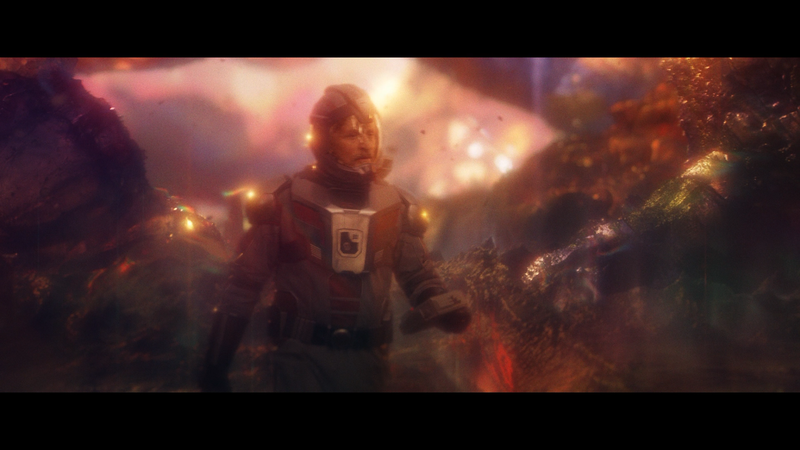 Meanwhile, thanks to Lang’s actions, Dr. Hank Pym (MICHAEL DOUGLAS) has lost his home and, along with daughter Hope (EVANELINE LILLY), are on the run and have set up shop at an old warehouse where they are attempting to gain access to the Quantum Realm, as there is a possibility that Hank’s wife, Janet (MICHELLE PFEIFFER), might have been able to survive and could escape as Lang had done so in the first movie. Something strange happens when Lang does make a connection with Janet as he’s able to see memories, which he conveys in a message to Hank. Eventually, Scott is dragged out of the home and using trickery, placing the ankle monitor on an ant trained to mimic Scott’s daily movements. Despite neither Hank nor Hope wanting anything to do with Lang, as he went to Germany with the suit without permission and thus exposed their efforts, they believe Lang’s connection with Janet could show them where she is within the QR. Ant-Man and the Wasp isn’t a top shelf comic book movie and slightly below the first movie, but I still had quite a bit of fun. Outside of the aforementioned mid-credit scene, it’s a fluffy film that one can sit down, relax and turn off one’s brain and just enjoy the show. 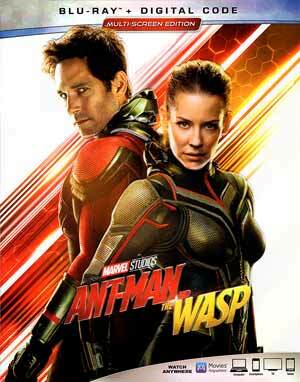 The cast is what sells the movie once again with Paul Rudd being the unexpected superhero and perfect for the role working well opposite Evangeline Lilly and Michael Douglas, both getting some more substance compared with their roles in the first film. As for the villain, while not as multi-dimensional compared to Killmonger (played by Michael B. Jordan) in Black Panther, Ghost, as portrayed by relative newcomer Hannah John-Kamen (she had mid-level roles on Tomb Raider and Ready Player One and a recurring role on Killjoys), was at the very least relatable and not yet another comic book villain wanting to rule the world or some such nonsense; it was a nice change-up and hope Marvel Studios finds a way to include her in other future projects. The addition of Laurence Fishburne (jumping from DC as Perry White) also was great to see even if it wasn’t as rich of a role while Wallace Goggins was comically inept and kind of pointless and ultimately unnecessary. Peyton Reed returns to the director’s chair and seems like the perfect person to helm a light-hearted film just like the first film, having previously worked on Bring It On and The Break Up. Nothing note-worthy about the direction with the editing, does present the story with brisk pacing. This release comes with a glossy and embossed slip cover. Inside is a code for the Digital HD copy. Introduction (1:08; HD) is a short intro with Reed on what he wanted to do with the sequel. 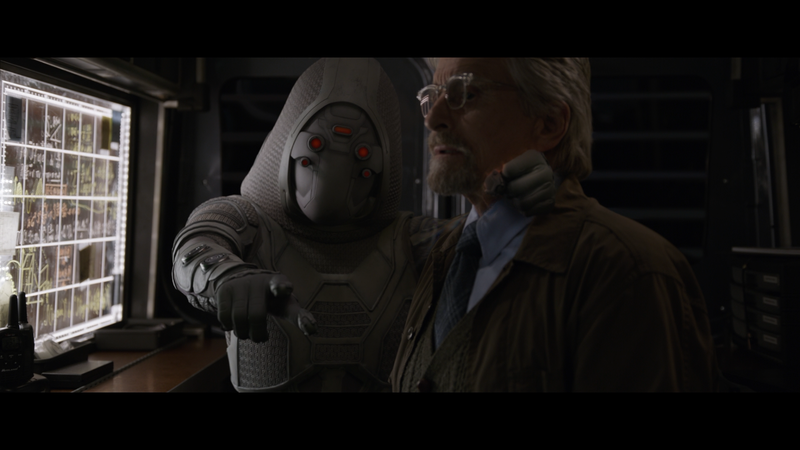 Audio Commentary – Director Peyton Reed sits down for a fairly lively and very informative track as he breaks down the story and some of the more technical aspects. 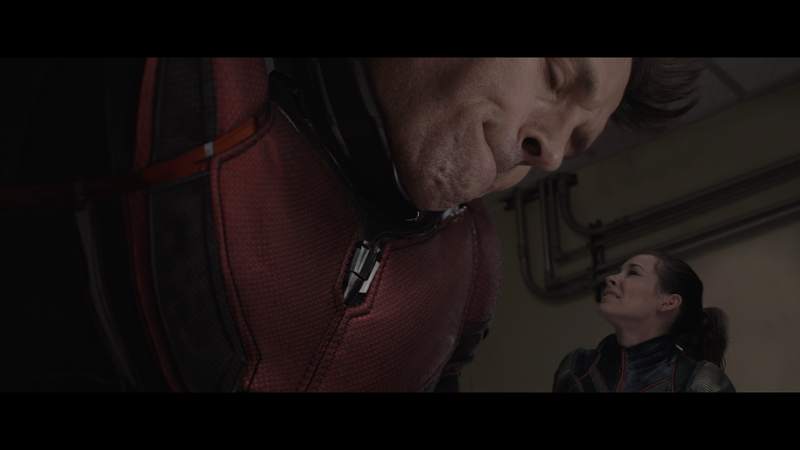 Back in the Ant Suit: Scott Lang (5:56) looks at the return of Paul Rudd and what his co-stars and crew appreciation for the comedic actor. A Suit of Her Own: Wasp (5:19) is a featurette on Evangeline Lilly’s expanded role for the sequel. Subatomic Super Heroes: Hank & Jane (4:09) is a profile on Michael Douglas and Michelle Pfeiffer’s role and how well they worked off of one another and what Pfeiffer brought to the cast. 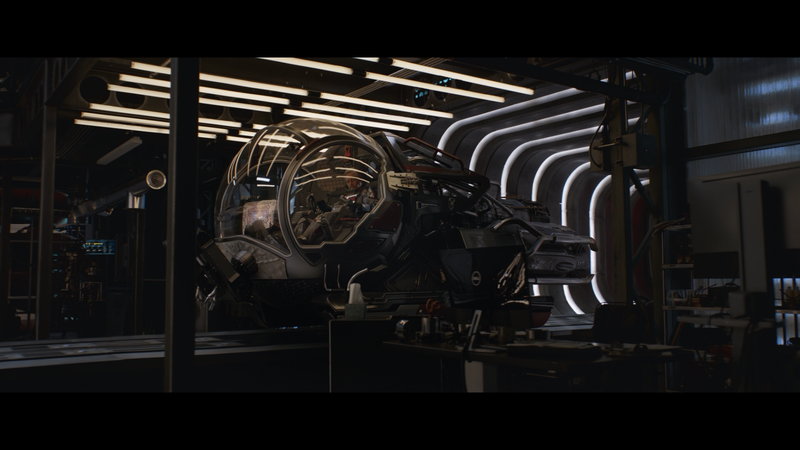 Quantum Perspective: The VFX and Production Design of Ant-Man and the Wasp (7:04) digs into the more technical aspects of the production and the challenges to go bigger and different from the first film. Gag Reel and Outtakes (3:47; HD) contains plenty of footage of the cast and crew having a good time. Included are Stan Lee outtakes. Deleted Scenes (1:38; HD) – There are a whopping two scenes that were cut. Optional commentary with Reed is available. 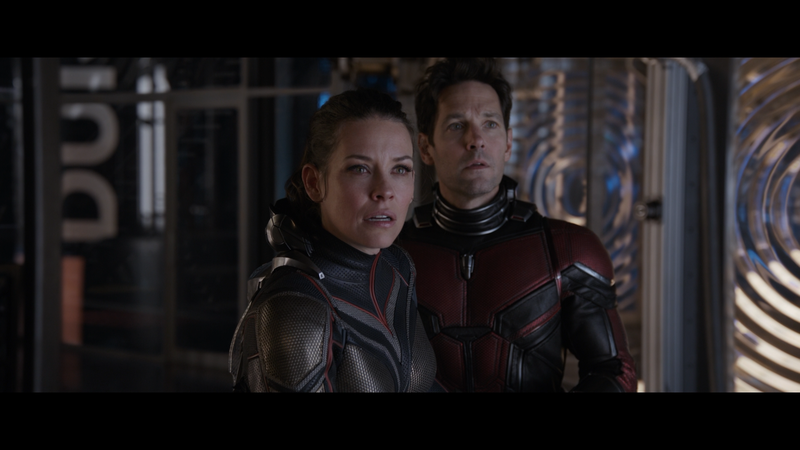 Ant-Man and the Wasp flies onto Blu-ray presented in its original theatrical 2.39 widescreen aspect ratio and given a beautiful looking 1080p high-definition transfer. Considering this is a more family-oriented comic book movie, and just like the first entry, colors are brilliantly bright throughout and detail is sharp and nicely defined. And as usual, for whatever reason, while the 4K release gets the newer Atmos track, this one is relegated to a still fantastic sounding DTS-HD Master Audio 7.1 track. Dialogue levels come through the center channel with excellent clarity and there is nice depth for the various action scenes and/or side off-screen elements. Would be nice if Disney, along with Sony and Fox, would just use the same audio codex, but even so, this one is perfectly suitable. Overall, Ant-Man and the Wasp is a fun and ultimately entertaining comic book movie and although it doesn’t measure up, at least in its depth, to other Marvel movies, still is a movie the entire family can watch and enjoy. The Blu-ray release offers up excellent video/audio transfers and a fine selection of bonus material.